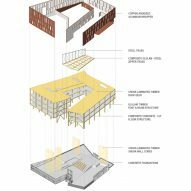 The University of Massachusetts Amherst's new design school is the first academic building in the US to have a structural frame made of cross-laminated timber, according to its architects Leers Weinzapfel Associates. The Design Building is situated within the university's campus in the city of Amherst, in central Massachusetts. 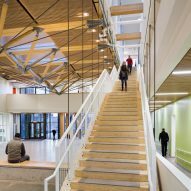 It is the first cross-laminated timber (CLT) academic building in the US, and the largest installation of wood-concrete composites in North America, the Boston-based firm says. The four-storey facility is the latest in a growing number of "mass timber" buildings. Cross-laminated timber (CLT) – an engineered wood consisting of laminated timber sections – is enabling wood to be used for larger and taller structures. Architects cite quality, sustainability and speed of construction as reasons for using the material. 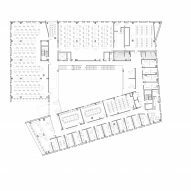 Encompassing 87,500 square feet (8,129 square metres), the Amherst facility contains the departments of architecture, landscape architecture and regional planning, along with the university's building and construction technology program. It is the first time these departments have been united under one roof. "We imagined this building as a teaching tool for the design disciplines," said Andrea Leers, a principal at Leers Weinzapfel. "I know from my own teaching experience that there's nothing more potent than being able to talk with students about the space around you." 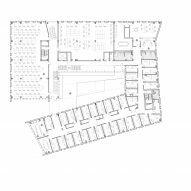 Occupying an irregularly shaped lot, the facility is composed of angular volumes wrapped in glass and metal. "The building's highly efficient envelope of copper-coloured, anodised aluminium panels and vertical windows suggests the colours and patterns of the region's forests and trees," the firm said. Glue-laminated timber was used for posts, beams, shear wall cores and "zipper" trusses (so named because they converge multiple structural members to a single point). Floor slabs are made of cast-in-place concrete and cross-laminated timber. In total, the building contains 52,500 square feet (4,877 square metres) worth of wood-concrete composite panels. 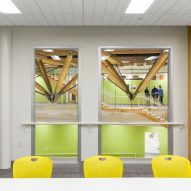 "It's the first academic building in the US to use to use timber for every major structural system," the architects said. The Amherst facility contains a series of light-filled studios, maker spaces and classrooms. 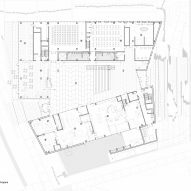 At the heart of the building is a spacious central atrium, which can accommodate lectures, exhibitions and informal gatherings. Ample glazing on the ground level enables views into the facility from the street. 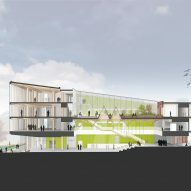 The building features a green roof, which serves as "an outdoor learning environment and experimental space for the landscape department". Native plants were used for the landscaping that surrounds the facility. Other sustainable elements include mechanical equipment zoned for optimal efficiency and a rainwater collection system. 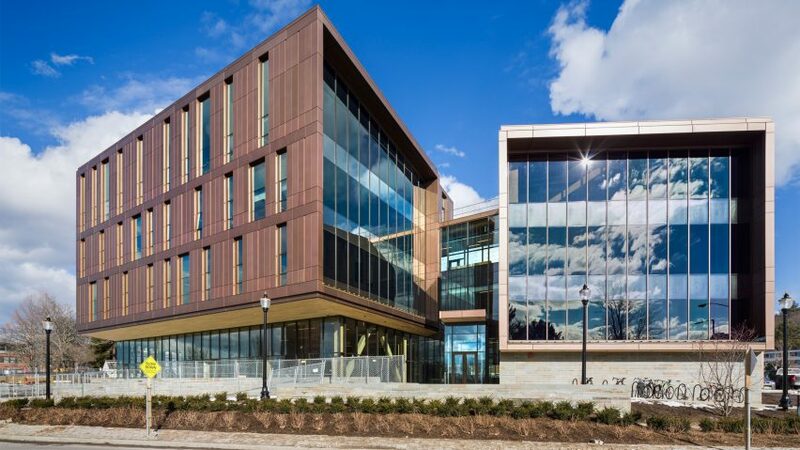 "Stormwater management directs roof runoff to a 'spring source' at the top of the site, filtering the water through bio-swales and timber dams to the site’s lower end and back to the Connecticut River," the firm said, adding that the project is aiming for LEED Gold certification. The $52 million (£40 million) project was partly funded by the Massachusetts State Legislature. The building sits among several arts-related buildings at the university and looks over a quad. 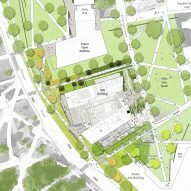 "Positioned in the centre of campus, the building is a critical link in the university’s arts necklace," said Steve Schreiber, professor and chair of the architecture department. Other projects by Leers Weinzapfel Associates include a water-cooling facility at Ohio State University that is sheathed in a copper-coloured aluminium screen. Structural engineer: Equilibrium Consulting, Inc.